The logical reasoning section is an important part of competitive exams. It contains different types of reasoning questions which are intended to judge analytical and logical reasoning skills of the candidate. The logical reasoning questions can be verbal or non-verbal: In verbal logical reasoning questions, the concepts and problems are expressed in words. The candidates are required to read and understand the given text or paragraph and according choose the right answer from the given options. In non-verbal logical reasoning questions, the concepts and problems are expressed in the form of figures, images or diagrams and the candidates are required to understand them before choosing the right answer out of the given options. Logical reasoning (verbal reasoning) refers to the ability of a candidate to understand and logically work through concepts and problems expressed in words. It checks the ability to extract and work with the meaning, information, and implications from the bulk of the text. The logics are expressed verbally, and you have to understand the logic before solving the questions. 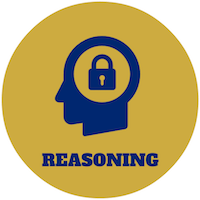 Logical reasoning (non-verbal reasoning) refers to the ability of a candidate to understand and logically work through concepts and problems expressed in the form of images, diagrams, etc. It checks the ability to extract and work with the meaning, information, and implications from the given images or diagrams. Here, the logics are expressed non-verbally, and you have to understand the logic before solving them. 1) Which number should come next in the series, 48, 24, 12, ......? So, on dividing 12 by 2, we will get 6 (option B). 1) RQP, ONM, _, IHG, FED, find the missing letters. The series consists of letters in reverse alphabetical order. Therefore, the missing letters are LKJ. A petal is a part of the flower. In a similar way, an engine is a part of the car. 1) I. All the colleges in the city had to keep closed for three days a week. II. Many students have left the local colleges. Closing the colleges for few days in a week and students leaving the colleges are independent issues which must be the effects of independent causes. 1) Which word does not belong to others? A kilogram measures weight and the other units are used to measure length. 1) Pointing to a photograph, a man said, "I have no brother, and that man's father is my father's son." Whose photograph was it? The narrator has no brother, so he is the only son of his father, and his father's son is he himself. Hence, the narrator is the father of the man in the photograph, so the man in the photograph is his son. Infection occurs first, then one visits a doctor, and after consultation, the doctor starts the treatment which is followed by recovery. 1) Peter is in the East of Tom and Tom is in the North of John. Mike is in the South of John then in which direction of Peter is Mike? 1) Which of the following diagrams correctly represents lions, elephants, and animals? Lions and elephants have no relationship to each other, but both are animals. An animal will always have a life. 1) What is Geeta's rank in the class? I. There are 30 students in the class. II. There are 10 students who scored less than Geeta. From statements I and II, we conclude that out of 30 students 10 students scored less than Geeta. It means, 19 students scored more than Geeta. So, Geeta's rank in the class is 20th. Thus, both the statements are needed to answer the question. 1) If in a certain language, NOIDA is coded as OPJEB, how is DELHI coded in that language? Each letter in the word NOIDA is moved one step forward to form the code OPJEB. So, in DELHI, D will be coded as E, E as F, L as M, H as I, I as J. Thus, the code becomes EFMIJ. 1) Assertion (A): James Watt invented the steam engine. Reason (R): It was invented to pump out the water from the flooded mines. Both A and R are true, but R is not the correct explanation of A. The need of self-working engine to pump out the water from the flooded mines led James Watt to invent the steam engine. A book cannot exist without pages. 1) If you are a fitness walker, you don't need to go to a health gym. You also don't need any fitness equipment for workout. All you need is a pair of comfortable athletic shoes. In this paragraph, the author is talking about the convenience of fitness walking. He is saying that fitness walking is a workout that does not need equipment and membership of a health gym. I. Pooja is older than Mukesh. II. Suresh is older than Pooja. III. Mukesh is older than Suresh. From the first two statements, it is clear that Mukesh is the youngest of the three. So, the third statement is false. 1) Statement: A severe drought is reported in many states of the country. I. The government should immediately provide financial assistance to the people of the affected states. II. The government should immediately send food, water, and fodder to the affected states to save people and livestock. In this situation, the government should think about saving the lives of people and livestock by providing basic amenities like food and water. Providing financial assistance will not provide immediate relief and would put an extra burden on the funds. 1) It is called Restitution when you compensate someone for damaging his or her property in some way. Which of the following situations is the best example of Restitution? Tom borrows his friend's car and returns the car with an empty petrol tank. He apologizes and tells his friend that he will fill the tank tomorrow. Tom borrows his friend's camera. Tom fails to zipper the case, and the camera falls on the ground, and the lens shatters. When Tom returns the camera, he tells his friend that he will pay for the damage. Peter asks Tom to stay in his apartment when he is out of the town. One day Tom arrives to stay and finds that pipe has burst and the apartment is filled with water. He calls the plumber to repair the pipe and pays for the repair. A pothole in the parking of Peter's company caused his flat tyre. He informs his boss and expects that the company should pay for the repair. Tom damaged his friend's camera when the camera was in his possession, and he agreed to pay for the repair. I) All heroes are villains. II) All villains are zeros. III) Some heroes are jokers. From the given statement and the above diagram, it is clear that option B is the correct answer. 1) Statement: "You are hereby appointed as a software engineer with a probation period of six months and your skills and performance will be reviewed at the end of the probation period for confirmation." - A line written in an appointment letter. I. The performance of the candidate is not known at the time of appointment. II. An individual is likely to prove his worth during the probation period. The performance of a new employee is generally tested over a span of time. So, I is implicit. The statement also says that the individual's worth shall be reviewed during the probation period before confirmation. So, II is also implicit. 1) Which answer figure will continue the same series as established by the problem figures? In problem figure A, the arcs are towards arrow then in the next step arcs are pointed away from the arrow and so on. Also, in the first two problem figures the arrows are pointing upward, and in the next two problem figures, the arrows are pointing downward and so on. And, in the lower part of the problem figures, the two signs are changing their positions alternately. Now, the answer figure 2 fulfills all the above conditions, so it will continue the series. 1) Select three figures out of the following five figures which when fitted into each other would form a square. 1) Which of the following figures is different from others? Only in figure D, the symbols on either side of the horizontal line are different. A color plate is to a color brush as a reel of a thread is to a sewing needle, i.e., color brush and sewing needle are the tools needed to perform the task. So, the needle will go in the empty box. 1) Which of the following series of figures follows the given rule? Rule: The closed figure loses its sides, and the open figure gains its sides as the series proceeds. In the first series, the closed figure loses sides one by one and the open figure gains sides one by one as the series proceeds.